Lion Escapes in Kenya, almost mauled man to death - BlogIT with OLIVIA!!! A man was injured by a lion that was subsequently shot dead by wildlife rangers as it was roaming outside the Kenyan capital Nairobi on Wednesday. It is the fourth time this year that lions have roamed outside Nairobi National Park and the second time someone has been injured by a lion in less than two weeks. 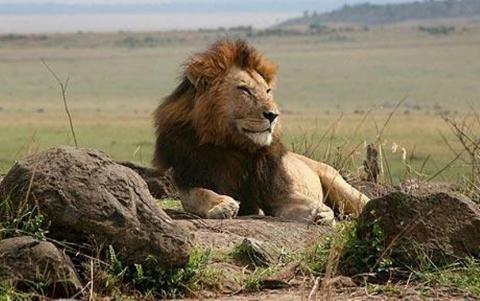 The dark-maned male lion was shot by a Kenya Wildlife Service (KWS) ranger after it hurt a passer-by near Isinya, a built-up area south of the capital where onlookers were gathering to stare at the agitated animal. “The stray lion that was roaming in Isinya has been shot dead after injuring a person,” said KWS spokesman Paul Udoto. Udoto said the injured man had been taken to hospital and the animal shot “after it (had) become wild”. In previous incidents this year the lions have either been herded back to the 117 square kilometre (29,000-acre) park or have returned of their own accord. The reserve is almost surrounded by a fast-growing city of over three million people. Earlier this month a 63-year old man was injured when a lion clawed at him close to a busy highway where motorists were honking their horns and snapping photographs and videos as they drove by. The park is not entirely fenced to enable traditional migration by animals in search of grazing. The big cats are under growing pressure as one of Africa’s fastest growing cities expands onto ancient migration routes and hunting grounds. Conservationists say lions lived there before people in the area and are not “escaping” the park nor “straying” into human settlements, rather people have moved into the lions’ habitat. In mid-February, two lions spent a day wandering through Kibera, a densely-packed city slum, before returning to the park, and days later more lions were spotted in town.